In the late 1960s, I was involved in a car accident and received severe multiple injuries. One of those injuries – a ruptured spleen – resulted in me being pronounced DOA (dead on arrival) at the hospital. Since I am now writing this, I was obviously resuscitated – but I lost a lot of blood and until the spleen was dealt with I was sustained by a large blood transfusion. Subsequently, I discovered that the blood I received was infected with Hepatitis and my liver was permanently damaged. At the time, I was happy to be alive and accepted that the blood tests available then were unable to detect the Hepatitis in the blood I received. But, as the Penrose Inquiry found, the contamination in blood products continued long after my experience of it, and many people suffered far worse consequences. Following the publication of Lord Penrose’s report Prime Minister David Cameron has apologised on behalf of the British government to those who were affected by contaminated NHS blood products in the 1970s and 80s. Hundreds of those infected with Hepatitis C and HIV were in Scotland, which was the only part of the UK to hold an inquiry. The Penrose report is a detailed factual account of events over near two decades and a forensic examination of medical evidence and the detail of therapy with blood products. Blame is not apportioned, and perhaps Lord Penrose did not consider that was part of his remit. But victims and families of those who died after receiving contaminated blood were unimpressed. At the end of the unveiling of the report in Edinburgh they heckled and shouted “whitewash”. The response to news that the Department of Health was providing an extra £25m in transitional relief was dismissed as a “joke” and “gesture politics” by one spokesman. It is clear that they see this story as far from over and will continue to press for a full explanation of who was at fault and a comprehensive compensation settlement. 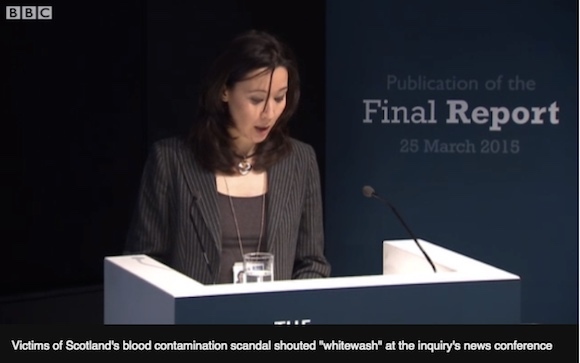 via Penrose inquiry: David Cameron apologises over infected blood – BBC News.